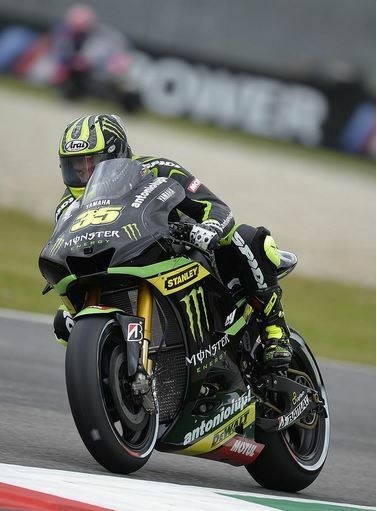 Cal Crutchlow secured his second successive podium of 2013 for the Monster Yamaha Tech 3 team this afternoon at the Italian track of Mugello. Starting from fourth position on the grid, the Coventry rider fell behind Ducati’s Andrea Dovizioso after missing out going through San Donato. However Crutchlow wasn’t resting on his laurels and soon passed his former team-mate in the fourth corner, Materassi to take fourth position. Crutchlow then remained unchallenged for the remainder of the race, slowly bringing down the cap between himself and the battle for second position. Following Marquez’s crash out of second position on lap 21 of 23, Crutchlow to secuered into a podium position following a strong charge from the 27 year old. Fellow Brit and team-mate Bradley Smith had a tough weekend at his debut MotoGP race in Mugello, following two heavy crashes at the Tuscan circuit. The 22 year old rookie obtained a left hand injury after a heavy fall on Friday in FP2, getting his hand caught under the bike. Warm-up brought another big crash for Smith, who suffered some bruising following a high-side at the same corner. Bravely the Oxfordshire rider decided to race and fought showing clear determination to bring home a top ten finish. Next Next post: A disappointed Rossi: "It was a bad crash"